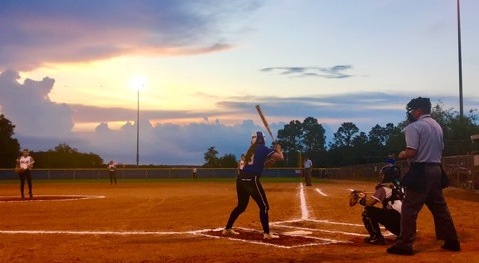 Lovie Haley bats for Matanzas as the sun sets Friday at the Roger Jones Kissimmee Klassic. Infielder Sami Chaplow went 2-for-3 with three RBIs and also had a steal and a sacrifice to support winning pitcher Kristin Kopp who went three innings and didn’t give up a hit. Alabama-bound pitcher/infielder Lexi Kilfoyl went 3-for-3 with two RBI and a home run, her 9th of the year, and outfielder Caitlin Blankenship went 2-for-4 with three RBIs to spark a rally for the defensing Class 2A state champs. Eliza Gonzalez scattered five hits over seven innings and only gave up a 4th inning run to earn the win for Pembroke Pines. She struck out four and only gave up one walk. In a nail-biter that went 10 innings, 2B Katherine Gray got a key sac bunt for an RBI in the top of the 10th and Bridget Filer scored what proved to be the game-winning run. In another extra inning contest, St. Cloud would score two in the first, West Nassau would tie it in the third and each team would put one on the board until shortstop Kaleigh Clay’s fielder’s choice drove in the decisive run in the top of the 8th inning. Bartow collect 12 hits including three by winning pitcher Jaden Williamson who went 3-for-4 with two RBIs and three runs scored. In the circle she went 5 2/3rd innings with only one hit allowed while striking out nine. In a back-and-forth game that saw five lead changes and went eight innings, Cooper City put two in the top of the 8th inning to pull out the win. Shortstop Brenna Lokeinsky went 2-for-4 with an RBI, which was the eventual game winner on a single in the extra frame. Last year’s Blue Bracket champ continues to impress both on offense and in the circle. First baseman Jaycie Brookshire went 2-for-3 with 3 RBIs and last year’s MVP, pitcher Madisyn Davis, went 2-for-3 with a pair of runs knocked in. She also pitched four shutout innings striking out seven while giving up just two hits and one walk.